The Belmont Apple, which was grown in Belmont County, Ohio, and named after the county, had its start in Quarryville, Pennsylvania. 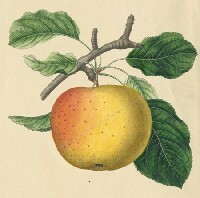 Barbara Herr Nissley Beam (1729-1822), planted an apple tree near her garden gate. It produced absolutely delicious apples, whether eaten fresh or cooked. In 1784 young Jacob (Jake) Nissley/Nessly, Mama Beam�s only son by her first marriage, took scions of this apple tree � which he called the Gate apple (because it grew by her garden gate) -- and planted them along the Ohio River in the Panhandle of Virginia. By 1799 he owned 2764 acres on the Virginia side, with 1800 acres under cultivation, half being in orchards, and 800 acres on the Ohio side � south of Steubenville -- most of which was in orchards. About that time, two of Mama Beam�s grown sons � from her second marriage � relocated to Belmont County, bringing scions of the apple tree, which they called the Mama Beam apple. From Mama Beam�s sons, many other Belmont farmers obtained scions, and planted their own orchards of Mama Beam apples. Soon confusion resulted among horticulturalists because Jake Nissley�s Gate apple and the Mama Beam apples looked and tasted the same. Finally, when it was learned that both apples were derived from the same apple tree, the problem was resolved by calling them all the Belmont apple. Like the Beam brothers, Johnny �Appleseed� Chapman started one of his own orchards in Belmont County, about five miles southwest of Stratton House. As was his practice, he planted it along rich, open bottom land � which today is covered by Piedmont Lake. However, because of Jake Nissley�s large orchards and the increasing number of orchards in Belmont County that were growing the Mama Beam apple, Johnny Appleseed soon decided to move on farther west. Thus, the great legacy that Johnny Appleseed spread throughout Ohio and Indiana started, in part, with the Belmont apple and �competition� from Jake Nissley and the Beam brothers. Note: In tribute to Johnny Appleseed, two scions from his last surviving apple tree are planted near Stratton House � north of the parking lot. We are seeking scions of the Belmont apple, which now is grown primarily in upstate New York. When we obtain them, we will plant a number of Belmont apple trees as well. Source: For additional details on the Gate/Mama Beam/Belmont apple, please see: Mama Beam�s Famous Apple, by James A. Galloway.